"A Keyblade with long reach that makes it easier to land critical hits, and deals higher damage when you do." Meet Vanitas on Destiny Islands. The Lost Memory is a Keychain for Ventus's Keyblade which appears in Kingdom Hearts Birth by Sleep. Ventus obtains it at Destiny Islands after he remembers his past as Master Xehanort's apprentice, and realizes Vanitas's origin. 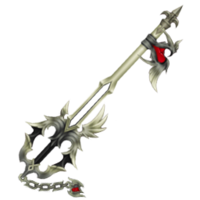 The Lost Memory is an ornate Keyblade that is predominantly silver and ivory-colored. The shaft is thin and smooth with a fleur-de-lis-shaped spike at its tip. The teeth are comprised by a pair of uneven, silver wings framing a broken, bright red heart. The base of the blade is adorned by a simple, grey heart, and the handle is black. Two uneven wings decorate the Keyblade's guard, with the larger wing being on the same side of the weapon as the teeth. The Keychain has silver chain links and the token resembles a miniature version of the Keyblade's teeth; a bright red heart surrounded by silver wings. The broken hearts, uneven wings, and black and white coloration in the Lost Memory's design represent Vanitas and Ventus's connection and incomplete hearts. Unlike Terra's Ends of the Earth and Aqua's Stormfall, which were also obtained when those Keyblade wielders visited Destiny Islands, the Lost Memory is not an upgraded version of Ventus's initial Keyblade. The Lost Memory's name references Ventus's own lost memories of his past with Xehanort and Vanitas.